About 38 million Americans suffer from migraines in the United States, according to the Migraine Research Foundation. The most commonly used and effective classes of medication, triptans and DHE (Dihydroergotamine), however, have a black box warning for two subtypes of migraine because of risk of stroke. Now researchers at Abington Jefferson Health have shown that patients who were given the drugs off-label had no stroke or other cardiovascular side-effects from taking the drugs. Not only does the study suggest these drugs are safe for this subset of migraine patients, it could also have implications for the nearly 10 million migraine sufferers who experience auras a disturbance in vision, touch, speech, thinking, or strength that usually precedes a migraine headache. “There are not enough medicines out there to appropriately manage migraine headaches,” says senior author Brad Klein, M.D., Medical Director of the Headache Center at Abington Hospital Jefferson Health. “At a time in history when an unprecedented number of people are getting hooked on narcotic opiates by way of prescribed medications as is the case with migraine sufferers as well we owe it to ourselves as physicians to try medications that could work without the risk of addiction,” says Klein. The study was published in the journal Headache. To determine whether there was any increased risk of stroke in basilar and hemiplegic patients taking triptans or DHE, Klein and researchers at Brigham and Women’s Hospital in Boston did a retrospective analysis, collecting data from four headache centers around the country. They searched for patients who had symptoms pointing to a basilar or hemiplegic migraine diagnosis and also received either a triptan or DHE treatment. Of the 80 patients they identified, they saw no cases of stroke or heart attack during the period of routine follow up, over several months. Although others had studied this effect before, this research had the largest patient cohort to date, and was also one of the first to examine patients treated with DHE. Migraines can be very complex to diagnose and there are few certified headache specialists in the United States only 500 for the 38 million sufferers, according to the Migraine Research Foundation. “Because auras are associated with basilar and hemiplegic migraine, many physicians refuse to give these drugs to any patients experiencing an aura out of a false sense of precaution,” says Dr. Klein. 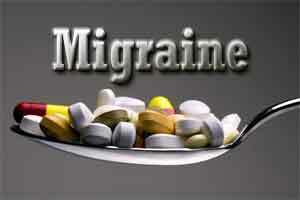 Instead migraine sufferers may be given other, less effective drugs such as opioid narcotics.